This orchard is a rare gem because it is only 35 minutes from KL and has a waterfall and 2 cyrstal-clear river running inside the land. The land is undulating with flat land at the entrance and also the hill top. It is planted with Kampong durian, chempedak, Musang King durian trees (young ones) and other fruit trees. Shown here is the valley leading to the waterfall. 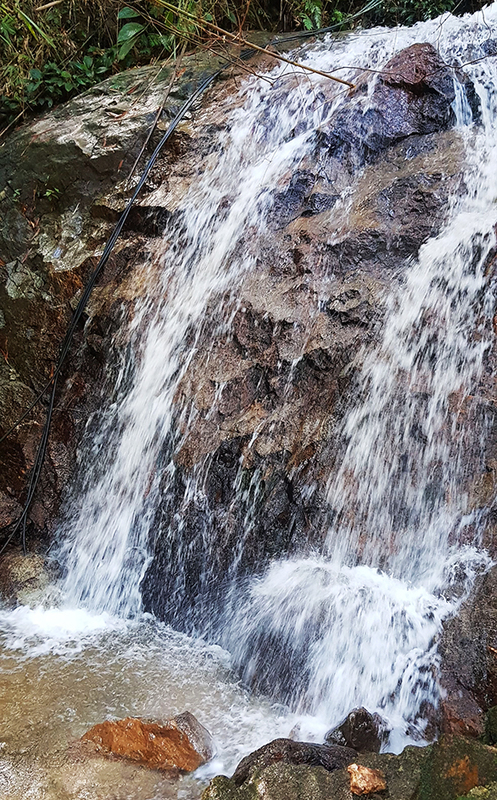 The waterfall is inside the land and the water is at its cleanest because it originated from the forest reserve adjoining the land. It will give the weary soul a refreshing and invigorating bath ! This is another river with crystal clear water inside the land. The cooling environment provided by the lush greenery and the sound of the river with many rapids alone will be enough to invigorate the tired soul of any city dwellers. a flat hilltop with panaromic views and a private waterfall. A perfect resort for company team building too.